Join the DSEI arms fair protests! The world's largest arms fair takes place at the ExCel Centre, East London, from 10-13 September this year. The Defence and Security Equiptment International, DSEI, describes itself as 'a landmark event presenting to the world the excellence of the UK defence and security businesses'. London CND says Britain's role is nothing to be proud of, including as it does the sale of arms to Saudi Arabia which fuel its war on Yemen. A coalition of campaigns and groups, coordiated by Campaign Against Arms Trade, are coming together to protest. One of these is East London Against Arms Fairs. ELAAF has organised against DSEI for several years, and already has some music protests in place this time round – starting on Saturday 6 April. Local CND groups and networks in London will be taking part in efforts to stop DSEI, and London CND will be coordinating CND groups across Britain to make sure they have up-to-date information they need to play their part in the 'No to Nuclear' protests. The Royal Navy plans to host a National Service of Thanksgiving to mark 50 years of the Continuous at Sea Deterrent (on the 3rd of May. New nuclear submarines are currently being constructed as part of a £205 billion Trident replacement scheme. We’re calling on the abbey to drop the service - but if it goes ahead, join us to protest the event. NATO, the North Atlantic Treaty Organisation, was founded on 4 April 1949. On the eve of its 70th anniversary, CND will be handing in a letter of protest at NATO’s Allied Maritime Command in Northwood HQ. There'll be plenty of No to NATO placards on hand to help make your feelings known! Join Croydon TUC for a screening of ‘Shadow World’, an incredible documentary about the global arms trade. This important documentary feature film, directed by Johan Grimonprez, exposes the appalling human cost of international arms dealing. It is in part based on the acclaimed book The Shadow World - Inside the Global ArmsTrade (Penguin books, 2012) written by Andrew Feinstein, founder of Corruption Watch UK. Having investigated the global arms trade for over fifteen years, Andrew has kindly agreed to give a Q&A session after the screening. Contributors to the film include whistleblowers, investigative journalists, prosecutors, military and industry insiders, along with interviews given by senior politicians. It explains how the international trade in weapons fosters corruption, undermines democracy, determines economic and foreign policies and spreads suffering around the world. Complicit in all this are government elites, military and intelligence agencies, defence contractors, arms dealers and agents. Examining some of the largest corrupt arms deals, it shows they account for almost 40% of all corruption in world trade. Shadow World highlights the real costs of war; how the arms trade drives it; and how weapons are turned against citizens of liberal democracies, reducing security for us all. Positive alternatives are presented through the experience of a peace activist and war correspondent, as well as the voice of Eduardo Galeano reading selections from his stories. In 1961, US President Dwight Eisenhower issued a prescient warning in his farewell address, broadcast to the nation: "In the councils of government, we must guard against the acquisition of unwarranted influence, whether sought or unsought, by the military-industrial complex. The potential for the disastrous rise of misplaced power exists, and will persist." Shadow World is about big corporations involving players at the highest levels of government. The defence industry claims to bolster our security but instead, it has created a more dangerous world. Join this protest outside Downing Street against 4 years of the British government’s complicity with Saudi Arabia’s war on Yemen. Wednesday 20 March 2019 Public Meeting with three Fukushima mothers 19.00 - 21.00 at SOAS Room to be confirmed. Joe Jukes from CND Peace Education will be introducing some techniques for using ‘controversial issues’ to help students understand their own various political and social positions. With conversations of gender and race becoming increasingly common, the way that education can handle these concepts can be more adventurous, creative and critical. The session will introduce some topics and methods for exploring marginalisation, power and agency, using nuclear weapons politics as an example, and will consider any assumptions we might reproduce in our practice. Join London CND for our bi-monthly Open Meeting - we’ll hear from a speaker on the INF treaty, and discuss our plans for protests at the DSEI Arms Fair. Open meetings are a great opportunity to find out more about London CND and get involved! Join London Campaign for Nuclear Disarmament for our annual conference, this year on the theme of president Trump and nuclear war. We'll have an afternoon of discussion on the Korean Peninsula, US women in action, the Iran nuclear agreement, prospects for Palestine, the INF Treaty, a view from Westminster, thinking global & acting local, and more! With speakers including Ambassador Husam Zomlot, Catherine West MP, Green Party Co-Leader Jonathan Bartley, and Medea Benjamin from Code Pink USA. 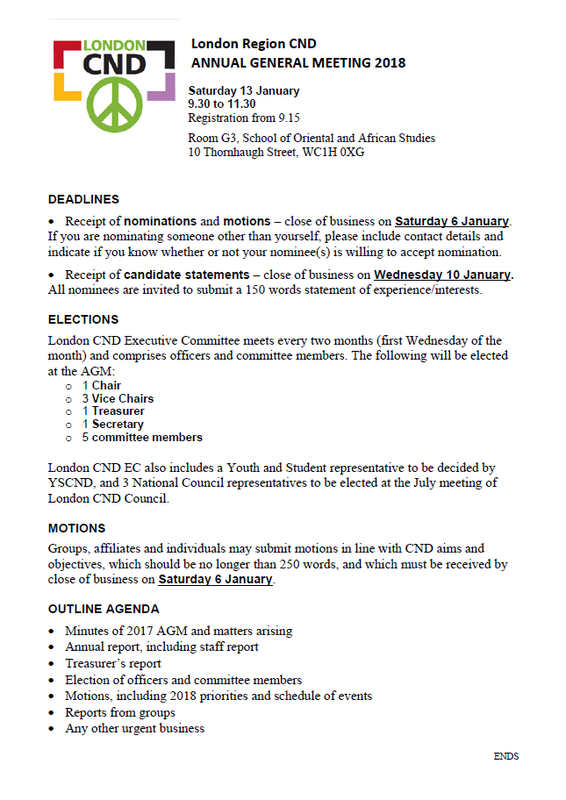 Come to London CND’s AGM, where we elect our committee and set our priorities for the coming year. The AGM is a great opportunity to find out more about London CND, get involved and have your say. The AGM takes place before our annual conference, at 9.15-11am on Saturday 12th January, in Room G51, School of Oriental and African Studies, 10 Thornhaugh Street, WC1H 0XG. You can find the agenda here and the details of how to take part here. All are welcome! One hundred years ago, on 11 November an armistice brought World War I to an end. One of the deadliest wars in history, around 9 million combatants and 7 million civilians died as a direct result. We’re re-launching Croydon Peace Council to reaffirm our commitment to a world free of war. Croydon’s buzzing with activity nowadays– so many groups and individuals working for peace, solidarity and the preservation of the planet. Carol Turner, author of Corbyn & Trident, will kick off an informal discussion about ways we can work together and support each other’s efforts. That’s after a reading by Jan Woolf, a co-founder of No Glory in War which campaigns to promote peace and international understanding as part of the centenary commemorations, and a short film, March to Aldermaston – a record of the first Ban the Bomb march, directed by Lindsay Anderson and narrated by Richard Burton. Join the Haringey Campaign for Nuclear Disarmament at their next public meeting, discussing the lessons of World War I in the age of Brexit and Trump. November 11th marks the 100th anniversary of the armistice that ended World War I. What can we learn from it about how to prevent war and conflict in the present age marked by the rise of nationalism and threats to a united Europe and international cooperation? Labour Party Shadow Minister for Peace and Disarmament, Fabian Hamilton MP, will be the guest speaker at this meeting. This will then be followed by an open question and answer session. The meeting will be chaired by Catherine West, MP for Hornsey and Wood Green. All are welcome to attend this free event. Light refreshments. For more information, contact David at: davidtrpolden1@gmail.com or call 020 7700 2393. The Sanctuary hall is at the back of the Moravian Church and can be reached by bus routes W3 and 144 which stop in Priory Road, near the junction with Park Road. Bus W7 is also close, which stops around the corner in Park Road. Join CND for this fascinating conference about the impact of new technologies on future wars, and the new challenges we’ll face as a result. More information to follow. There’s so much going on in the East End – so many groups and individuals working for peace, solidarity and the preservation of the planet. At Tower Hamlets CND we’ve felt for some time that East Londonneeds a forum as a means of publicising all our activities to a wider audience, and working together on joint events from time to time – to the advantage of us all. With this in mind, we’re inviting you – whether you’re an individual or member of a local group – to an initial meeting to thrash out how we can work together to bring this about. Carol Turner from London CND will be there with some initial ideas, but we want your input and your own ideas too. Just turn up. Or even better, let us know you’re interested by registering for free on eventbrite here. If you need to contact us, email eastlondonpeacenetwork@gmail.com or phone Phil on 0207 247 5269. Join the London Campaign for Nuclear Disarmament for a drinks reception in the House of Commons and meet two of our vice-presidents, Catherine West MP and Jenny Jones, Baroness of Moulsecoomb. You'll get the chance to look around the historic building and meet other CND supporters over a glass of wine. Join us at the West London Peace Market on Saturday 22nd September as we launch a new peace network for the area. After the market, at 5pm, we'll be in the Church Hall with some refreshments to hear about how you can get involved in peace activism. Gather at Faslane Peace Camp at 12 noon and walk from the Peace Camp to the North Gate of the base for the rally, a distance of around a mile. The rally should end between 3 and 4 p.m. The aim of the rally is to to highlight the strength of support from many UN member states for Scotland, a country hosting nuclear weapons against its wishes. Scotland is a significant and relatively autonomous part of a nuclear-armed state which opposes its possession of weapons of mass destruction. As things stand we cannot become a party to the new UN Treaty for the Prohibition of Nuclear Weapons but there are lots of ways in which we can align ourselves to the Treaty. The September rally will be a fine opportunity to mark our determination to do so. The rally will feature speakers from many countries. Confirmed to date are: Sharon Dolev (Israel), Founding director of the Israeli Disarmament Movement, Ekatrina Earsalovna (Russia), Professor of International Relation, Ural Federal University, Anthony Donovan, writer, organiser and documentary maker on peace and disarmament from New York, Emad Kiyaei (Iran), a consultant who provides political, business and civil society leaders with strategic advice in the intersection of political risk, diplomacy and technology, Maaike Beenes (The Netherlands), a young campaigner with PAX in the Netherlands, Members of the People’s Democratic Party (South Korea) who visited Scotland as part of their Peace Expedition, Allison Pytlak (Reaching Critical Will), who was awarded, along with Ray Acheson, the UN Women’s Champion for Change status this year for their advocacy in the campaign for the TPNW and Timmon Wallis (United States) – National Co-ordinator of NuclearBan.US. We really need to make this a huge event to show the level of international support for Scotland’s opposition to nukes and to present a clear challenge to the UK Government to sign the TPNW, enter negotiations and scrap their nuclear policies. We also need to re-assert our vision for Scotland as a land free of weapons of mass destruction and energetic in our support for their removal from the UK and the whole world. As well as the rally itself there will be other events over that weekend to take advantage of the presence of campaigners from far and wide. Event organised by West London CND. Stalls from groups campaigning for peace and social justice, including CND, Stop the War, Palestine Solidarity Campaign, Stand Up to Racism, Refugees Welcome. Local campaigns and charities, collectables, retro and vintage goods. London CND invite you to a free film screening of The Man Who Saved The World, a 2014 docudrama with Kevin Costner: how the actions of Stanislav Petrov averted a nuclear war. The screening will be opened by Catherine West MP. Tickets are free but donations on the day are welcome! Please book in advance - click here. 6th August: Ceremony in Tavistock Square from 12pm with guest speakers including Bruce Kent and Amelia Womack, opened by the Mayor of Camden. 9th August: We will join commemorations at the London Peace Pagoda as follows. 18:30 Commemoration of the life and witness of Blessed Franz Jagerstatter at the crypt chapel, Ambrosden Avenue, behind Westminster Cathedral. 19:30 Peace Walk starts from Westminster Cathedral. 20:30 Nagasaki Day Commemoration ceremony at London Peace Pagoda, Battersea Park. 4th August: Hiroshima vigil outside the Churchill Theatre, Bromley 12.00 - 3.00 pm followed by procession of banners and placards and floating of chrysanthemums on a lake. 6th August: Assemble in Canbury Gardens on the Kingston river bank, at 8.30 pm. Please bring white flowers to cast onto the water in remembrance of those who died, and candles to illuminate the path beside the river. 6th August: Hiroshima Day commemoration at Charlton House from 6.00 p.m.
9th August: Nagasaki Day commemoration. Desmond Tutu Peace Garden, Chilbrook Meadows, 1.30 p.m. to 3.30 p.m.
6th August: Hiroshima Day commemoration on Wimbledon Common from 6.30pm. Activities will include floating candles on Rushmere Pond, music and poetry. This Council will focus on local groups – your plans for the future and, in particular, what support London CND can offer. We will also be electing London’s reps to CND National Council - details below! All are welcome - please come along to talk about what London CND can do in your area! Want to be more involved in CND’s work in London? If you’re a member of a local peace group or an affiliate, or an individual signed-up supporter of London Region CND, here’s how. When London CND Council meets on Wednesday 4July we’ll be electing 3 people to represent us on the National Council of CND UK. NC reps are elected for a one year period and expected to attend three Council meeting which take place in London on a Saturday in December, March/April and June/July. The dates of all these meetings are notified in advance by CND UK before the first meeting in the cycle. report back on Natioal Council debates and decisions to LRCND Executive Committees, which take place every two months. If you’re elected, you automatically become a member of London EC and can play a part in deciding what we do. A conversation on social justice: where does nuclear disarmament fit in? How does nuclear disarmament fit in to the global struggle for social justice - and should young people on the left care? CND vice-president and former General Secretary Bruce Kent will be joined by guests from Labour and the Green Party. The recent visit of Mohammad bin Salman, Saudi Arabia’s Crown Prince at the invitation of Theresa May has focused attention on UK involvement in the Gulf. SAYED AHMED ALWADAEI and STEVE BELL will lead a discussion on why the UK’s there and what its impact is on Middle East relations in a time of continuing tension. Sayed Ahmed Alwadaei, founder of Bahrain Institute for Rights and Democracy UK, is a prominent campaigner against political repression and abuse of human rights in Bahrain. His citizenship was revoked in 2015 for organising protests against the Bahraini Royal Family’s visit to the UK. His wife, Duaa was recently tried without formal notification and sentenced in absentia for allegedly insulting a public institution. US nuclear strategy: are we headed for nuclear war? A joint SOAS-London CND meeting exploring the theme of new nukes: what technological developments are taking place? What impact on Trident, the UK’s nuclear weapons system? What role do they play in US security strategy? A workshop for activists in two parts: social media and local press. This will be a really good opportunity to learn how your group can use facebook to communicate with members and supporters, and how to publicise your activities in your local press. There will be a cost of £15 to members attending on behalf of a local group (so hopefully the group can cover some or all of that cost), and a suggested donation of £5 of members attending as individuals. We only have space for 10 attendees so please email info@londoncnd.org to book your place! Friday March 9th, 5.30-7.30pm: candle-lit vigil outside Japanese Embassy, 101-104 Piccadilly WC1 (near Green Park tune) with speeches, poetry and music. Sunday March 11th: march from Japanese Embassy (assemble noon) to Old Palace Yard, opposite Houses of Parliament for rally from 2-3.30pm, with speeches, including from Kate Hudson and Bruce Kent, music and poetry. Wednesday March 14th, 7-9pm: Fukushima Anniversary Public Meeting in Attlee Room, Portcullis House, Houses of Parliament. Speakers: Kate Hudson, CND General Secretary, Amelia Womack, Deputy Leader of the Green Party, Professor Andy Stirling, Professor of Science and Technology at Sussex University, Professor Stephen Thomas, Professor at the University of Greenwich Business School, Dr. Ian Fairlie, Independent Consultant on Radiation in the Environment, and Rika Hirose Haga, of the School of Geography and Sustainable Development at the University of St.Andrews. Chair: Catherine West MP. Free entry. Allow 20 minutes to go through security into Portcullis House. Portcullis House is on top of Westminster tube station. Entrance is at end facing the Thames. This book is timed to coincide with the Campaign for Nuclear Disarmament’s 60th anniversary, drawing on archive material and interviews with activists from across the decades, and situating CND’s current work in the context of the Trump presidency and increasing global tensions around nuclear weapons. The author is Kate Hudson, a political activist, peace campaigner, academic, and General Secretary of CND. She will be introduced by Victoria Brittain, journalist and writer. The event will end with a book signing. You will be able to buy a copy of the book at the event and speak to the author as she signs your copy. Theresa May has invited the Saudi Crown Prince Mohammad bin Salman to visit Britain on the 7th-9th March. Bin Salman is the second most senior member of the Saudi regime. He currently oversees the bombing of Yemen, which has caused what the UN has called "the worst humanitarian crisis in the world". The Saudi regime has supported repression in Bahrain, imposed a blockade on Qatar, and detained the Lebanese Prime Minister. Join us at Downing Street to tell May and bin Salman that he is not welcome in London! Want to take action in the meantime? Bin Salman is the second most senior member of the Saudi regime, which has one of the worst human rights records in the world. Torture, arbitrary detention, and other appalling abuses are widely documented. In 2017 alone, Saudi authorities executed over 100 people. The Crown Prince has overseen the war on Yemen, creating tens of thousands of deaths and injuries. He has created, in the words of the UN, “the worst humanitarian crisis in the world”. British made jets and bombs have played a major role in destroying civilian targets and the poor nation’s infrastructure. UK personnel, from the armed forces and BAE Systems, are present in the Saudi operations centre, aiding this catastrophe. The Saudi regime has also supported repression in other states, notably Bahrain where its military supported the crackdown on peaceful protestors in 2011. Recently, the Crown Prince has established a blockade of Qatar, and held the prime minister of Lebanon in custody. Screening of 3 short films to celebrate the movement's anniversary. Join London CND for our 2018 conference! Our 2018 AGM will take place on Saturday 13th January at SOAS, on the morning of our annual conference. Details of the agenda are below.